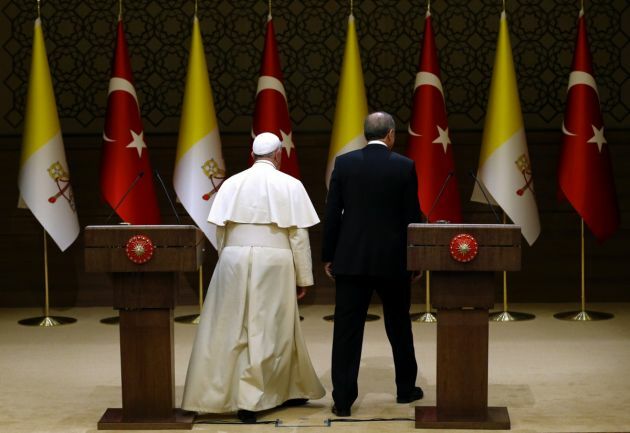 (Photo: REUTERS / Umit Bektas)Pope Francis and Turkey's President Tayyip Erdogan leave after addressing to media at the presidential palace in Ankara November 28, 2014. Pope Francis begins a visit to Turkey with the delicate mission of strengthening ties with Muslim leaders while condemning violence against Christians and other minorities in the Middle East. Turkish President Recep Tayyip Erdogan has accused Europe of staring a "clash" between Christianity and Islam with a ruling allowing employers to ban headscarves as part of wider restrictions on religious and political symbols. Speaking hours after his foreign minister warned that "holy wars will soon begin", the Turkish President on March 16 launched a fresh attack as part of an ongoing row over the cancellation of his supporters' rallies in different European countries. Erdogan's strong words come as enmity between North Atlantic Treaty Organization member Turkey and different EU nations has ratcheted up in the past week. Using terminology alluding to the period of the Crusades, he said the European Court of Justice ruling that upheld the dismissal of two Muslim women who refused to remove their hijabs started a "clash between crescent and cross." "Shame on the EU. Down with your European principles, values and justice," Erdogan told supporters in Sakarya, The Independent reported. "They started a clash between the cross and the crescent, there is no other explanation." In his combative speech, Erdogan lashed out at European leaders in The Netherlands and Germany after they prevented Turkish ministers from holding events designed to drum up support Erdogan ahead of a constitutional referendum, that could strengthen his powers. The Turkish President said the Dutch Prime Minister Mark Rutte, who the beat far-right leader Geert Wilders in the March 15 general election in Holland, had lost Turkey's friendship by banning its ministers political campaigning in the country. Earlier Mevlut Cavusoglu, Turkey's foreign minister had claimed "holy wars will soon begin" in Europe, in spite of the defeat of far-right leader Geert Wilders in the Netherlands elections. Cavusoglu did not welcome the victory for Rutte's centre-right People's Party for Freedom and Democracy (VVD). "Now the election is over in the Netherlands...when you look at the many parties you see there is no difference between the social democrats and fascist Wilders," he said according to a translation by Turkey's Hurriyet news. "All have the same mentality. Where will you go? Where are you taking Europe? You have begun to collapse Europe. You are dragging Europe into the abyss. Holy wars will soon begin in Europe." Then on March 16, Turkey's Interior Minister Suleyman Soylu threatened to "blow the mind" of Europe by sending 15,000 refugees a month to EU territory. Almost a year ago Turkey and Belgium on March 18 signed a landmark deal that substantially lessened the flow of migrants from Turkey to Europe. But the accord is now hanging in the balance due to the diplomatic crisis over the blocking of Turkish ministers from holding rallies in Europe, Agence France-Presse reported. "If you want, we could open the way for 15 000 refugees that we don't send each month and blow the mind" of Europe, Soylu said in a speech, quoted by Turkey's Anadolu news agency.